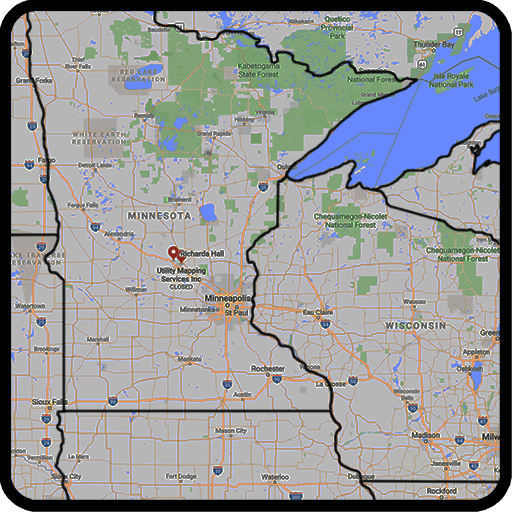 Northland Fire offers fire extinguisher training seminars to ensure proper use and understanding of common hand-held and wheeled fire extinguishers. Trainees will learn the proper techniques to effectively use a fire extinguisher on any class of fire they are faced with. Hands-on training is valuable to save lives and property when small fires ignite. WATER AND FOAM - Extinguish the fire by taking away the heat element of the fire triangle. Foam agents also separate the oxygen element. Water extinguishers are for Class A fires only. 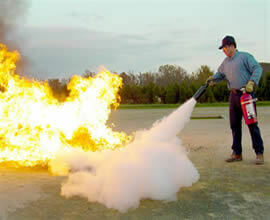 Foam extinguishers can be used on Class A & B only. CARBON DIOXIDE - Remove the oxygen and heat elements of the fire triangle. For use on Class B & C fires while usually ineffective on Class A fires. DRY CHEMICAL - Interrupt the chemical reaction of the fire triangle. Ordinary dry chemical is for Class B & C fires only. Some multipurpose agents also create a barrier between the oxygen element and the fuel element on Class A fires. It is important to use the correct extinguisher for the correct fuel. WET CHEMICAL - Removes the heat of the fire triangle and prevents re-ignition by creating a barrier between the oxygen and fuel elements. Developed for Class K fires. Some may also be used on Class A fires. CLEAN AGENT - A.K.A. Halogenated, extinguish the fire by interrupting the chemical reaction of the fire triangle with newer and less ozone depleting halocarbon agents. Primarily for Class B & C fires. Some may also be used on Class A fires. DRY POWDER - Separate the fuel from the oxygen element, or by removing the heat element of the fire triangle. Use for Class D fires only, as they are ineffective on all other classes of fires. WATER MIST - Remove the heat element of the fire. An alternative to Clean Agent extinguishers where contamination is a concern. Primarily used for Class A fires, though safe for use on Class C fires as well. CLASS A - Ordinary combustibles such as wood, paper, cloth, trash, and plastics. 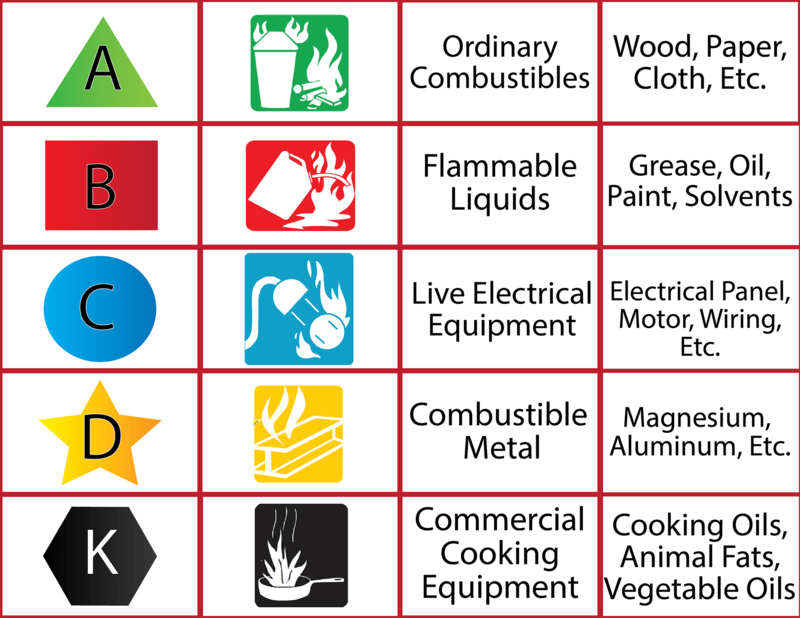 CLASS B - Flammable liquids such as gasoline, petroleum oil and paint. Also flammable gases such as propane and butane. Class B fires do not include fires involving cooking oils and grease. CLASS C - Energized electrical equipment such as motors, transformers, and appliances. Remove the power and the Class C fire becomes one of the other classes of fire. CLASS D - Combustible metals such as potassium, sodium, aluminum and magnesium. CLASS K - Cooking oils and greases such as animal fats and vegetable fats. AIM - Aim the nozzle or hose at the base of the fire from the recommended safe distance. 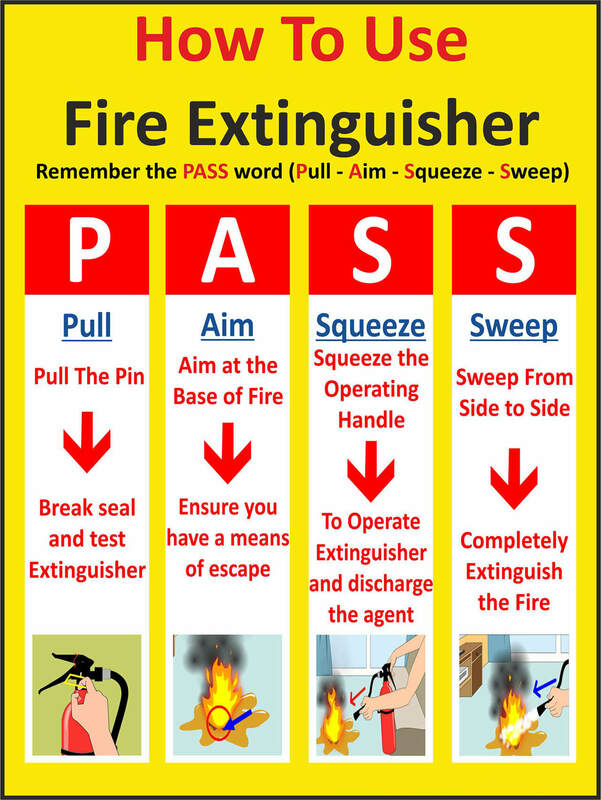 SQUEEZE - Squeeze the operating lever to discharge the fire extinguisher. SWEEP - From the recommended distance, sweep the nozzle or hose from side to side until the fire is out. Move forward or around the fire area as the fire diminishes. Watch the area in case of re-ignition.